It is fair to say that this months ‘Person of the Month’ can truly be said to have got Blarney back up on its’ feet again! Receiving a huge amount of nominations ‘Happy feet walking and running club’, was started in Blarney earlier this year by Dawn O’Flynn, Danielle O’Flynn, Grainne Crowley, Helena Fogarty, Lila Sullivan and Mairead O’Donavan. 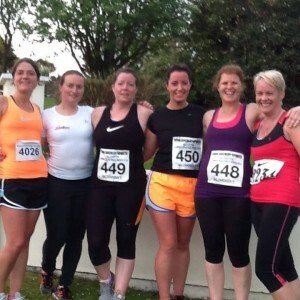 The group has its origins as a group of ladies that started to run together, and who then began to enter a few races. Loving the craic, the girls often joked that they would have to start their own club in Blarney as they felt there was a need for it in the community. Dawn’s dad Donal O’Flynn, who attended all their races to encourage them, spurred them on but they never really thought it would happen. Fate turned their pipe dream to a reality via an enquiry from a lady who had moved into the area and was looking for a running club, and from there, thanks to help from local lady Kay Dennehy who booked a room for the clubs first meeting, ‘Happy Feet’ took off. More than 100 people now attend their Tuesday and Thursday night sessions, and numbers seem to be growing not waning. They cater for all, from walkers to serious runners, and everyone receives the same warm welcome and encouragement. The girls have received help from Cathal Twomey, who came to help them on their first night and is still there; Michelle Crowley who also came on board from the start; William Browne who has been a fantastic help with warm ups and cool downs and filling in where needed; and Katie Ledwith who is working away in the background on a few surprises! As they say, “It’s all about the community. Getting healthy physically and mentally, and making new friends.” Congratulations ladies.